Professor Takahiro Seki and his coresearchers at the Graduate School of Engineering, Nagoya University, have developed a novel photoalignment technology for liquid crystal materials. Their paper was published online in Nature Communications on February 18, 2014. Liquid crystal (LC) materials are used in memory and display of televisions and computers. LC molecules exhibit properties intermediate between liquids and solids. When exposed to external stimuli, they can align in an orderly fashion, similar to molecules in solid substances. Previously, the method used to align molecules included rubbing of solid substrate surface. 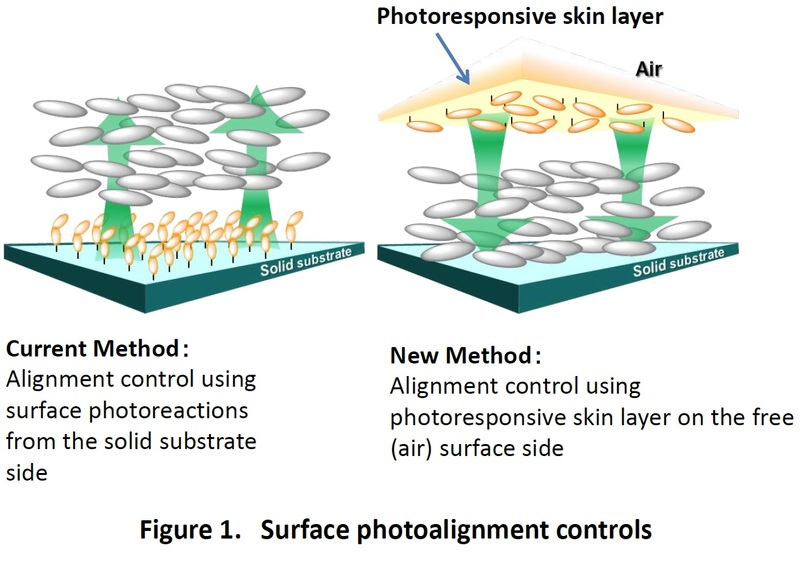 On the other hand, a method to align molecules by polarized light emitted from a solid substrate surface side onto a photoresponsive layer was developed around 1990. This method has been used for the development of LC displays and is becoming an important industrial technology (see current method in figure 1). Professor Seki's research group used solidified polymer LC molecules instead of low-molecular-weight LC molecules. Since LC molecules are fluidic in nature, they need to be wedged between two solid substrates. However, because of the solidified nature of polymers, they do not require two solid substrates; therefore, they can be exposed to air. Prof. Seki formed a 20 nm film composed only of a photoresponsive polymer on LC molecules and succeeded in aligning the molecules by illumination from the air surface (see new method in figure 1). This method does not require any maneuver of the solid substrate, thereby reducing requirements for materials used as solid substrates. When using light from surfaces of solid substrates for aligning molecules, substrates must be transparent. However, the new method enables the use of various materials as solid substrates, such as deep-colored materials and flexible material sheets. This characteristic enables the development of various devices with varying designs. 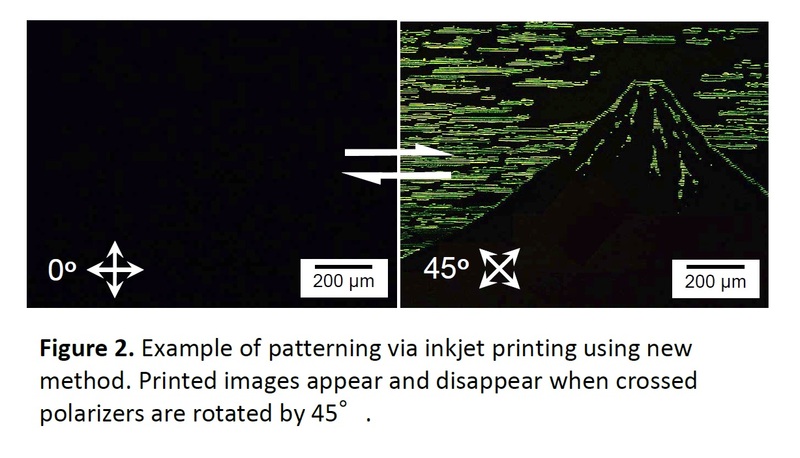 Furthermore, as shown in figure 2, This technology can be potentially applied to security printing of passports and bank notes by inkjet printing on the air-side surface. This research is expected to increase the use of LC materials and devices. 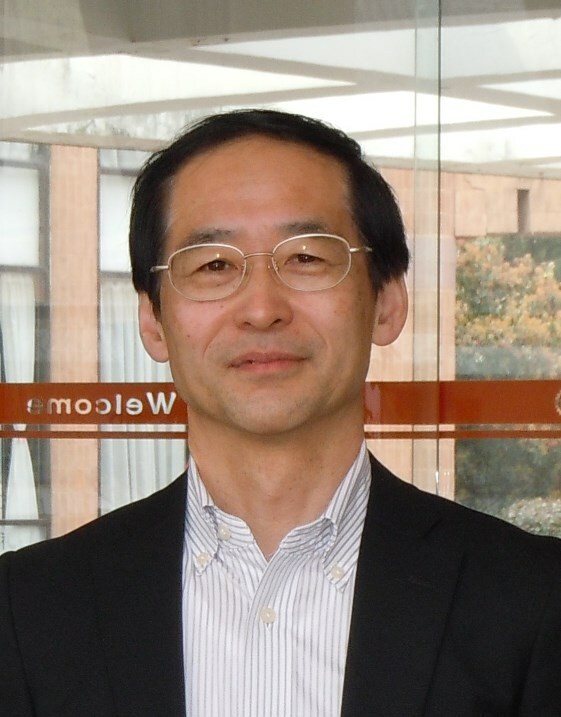 Professor Takahiro Seki was fascinated by changes in substances and conducted research on polymer molecules at Tokyo Institute of Technology as a student. He finds his research rewarding when he makes novel experimental discoveries and challenges existing knowledge. He accepts experimental results unconditionally and interprets them in an unbiased manner. He continues to make new discoveries and greatly values instant innovation. LC materials function when each molecule moves in a stepwise manner. Some major body tissues are composed of LC and polymer materials and are often termed "soft materials." Research into dynamic materials may finally aim to realize natural systems artificially. Our research utilizes the nature of LC, and I would therefore like to explore the possibility of using soft materials from various aspects. You may envisage research as being done alone. However, in many cases, interaction and communication with others are vital in research to gain new insights. What you can do alone is very limited. This concept may sound paradoxical, but I believe that originality is essential in research. It is possible that your interests may not correspond to what others find interesting. I hope you refine your sensitivity and research with brevity.